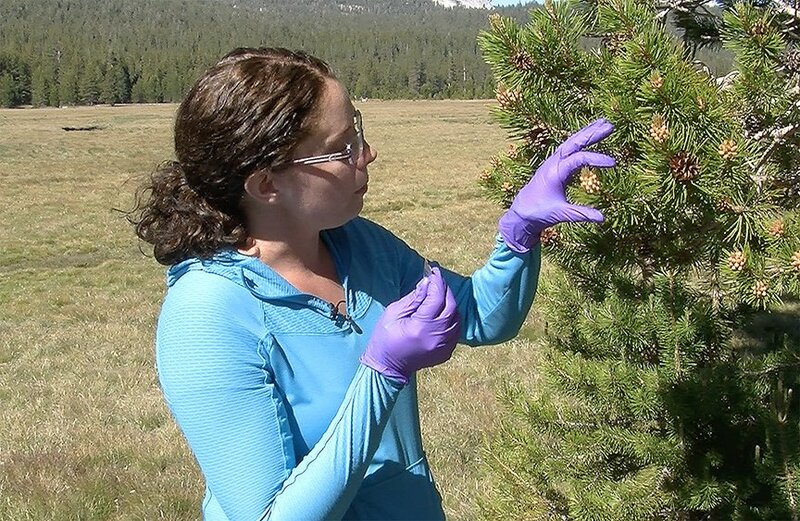 The Mildred E. Mathias Graduate Student Research Grant Program funds research at NRS reserves. Graduate students from all UC campuses pursuing any discipline are eligible. Providing up to $3,000 each, the grants encourage students to establish independent research projects at reserves. Students gain experience submitting research proposals, writing progress reports, and managing a research budget. Awardees are invited to present their findings at the biennial Mathias Graduate Student Research Grant Symposium. The program is named for UC Los Angeles botanist and professor Mildred E. Mathias, one of the founders of the NRS. Since its inception in 1988, more than 400 UC students have received nearly $800,000 in Mathias Grant funding. 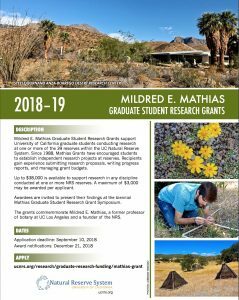 Application information for the 2019-2020 Mildred E. Mathias Graduate Student Research Grant Program will by posted in July 2019. More information about eligibility, application procedures, and evaluation criteria can be found here. Recipients of Mildred E. Mathias Graduate Student Research Grants are invited to present their findings before peers at the NRS's Mathias Graduate Student Research Grant Symposium. The weekend-long event is held every other year at one of the NRS's reserves. The symposium is supported by the Kenneth S. Norris Endowment Fund for the California Environment, which provided to the NRS by the David and Lucile Packard Foundation. Previous Mathias research projects have included works from across the academic spectrum. Award recipients have studied intertidal invertebrate responses to predators, plant ranges in the White Mountains, wasp ecology in the Mojave Desert, chipmunk range responses to climate change in the eastern Sierra, large-format digital photography across the reserve system, ecological factors affecting tick-borne diseases in California, and much more.